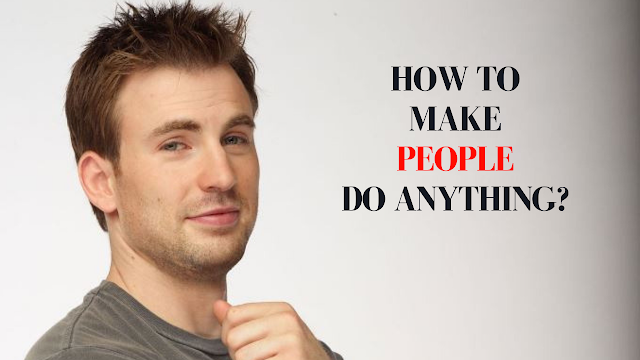 How to make people do anything? Think back to a time when you wanted someone to do something for you. Maybe you wanted a friend to do you a favor, maybe you wanted the hiring manager to give you a job that you really liked or maybe you wanted to get a better deal on a car earbud. Every day, humans speak thousands of words without ever really giving much thought into the true power of what they're saying. A famous quote once said handle them carefully forwards have more power than atom bombs and when spoken in the right combinations words can quite literally get anyone to do anything you want. You can take two people who are identical in almost every way, drop them into the world and tell them to find success and one person could get dramatically different results than the other, but why? It all comes down to knowing what to say? How to say it? and how to truly make every word count? The right combination of words speaks directly to a person's subconscious mind and influences the main part of the brain that people use to make decisions. What most people don't realize is that the subconscious mind only produces yes or no answers and it makes decisions quickly. With a few key phrases, you can become incredibly persuasive and influential and once you have done this you'll find it much easier to get anyone to do anything that you want. Then the first power phrase to remember is I'm not sure if it's for you, but this combination of words allows you to introduce an idea to anyone quickly, easily, and cleverly and these words instantly tell the person's subconscious that there is no pressure. more interested in what you're saying. The key word here is "but" and instinctively we usually pay most attention to what comes after this word. Imagine you're that dude outside of Walmart trying to get signatures for your petition that nobody really cares about you. Would say I'm not sure if it's for you but do you have a minute to check this petition up. In any situation when you want someone to do something just start the sentence out with "I'm not sure if it's for you but and simply add whatever it is that you want to ask after the word.. but". Now the second key combination of words is "open-minded" and it works very similarly to the first phrase. All that you have to do is add this phrase before anything you want to ask. For example, imagine you want your friend to loan you his motorcycle for a day. You would start talking to him and when the time feels right you would say how open-minded would you be about letting me borrow your motorcycle for the day? The reason this combination of words works so well is because 90% of people view themselves as being open-minded. So subconsciously saying no to your request goes against a belief that they have about themselves which actually makes it very difficult to say no. Now the next combination of words it's like an atom bomb that you can use to win any argument with someone who thinks that they know everything. Think about this for a second during any argument between two people each person has their own opinion based on a foundation of knowledge that they have about the topic. By confidently calling out the knowledge base of their topic you can actually force them to doubt their own opinion and the key phrase here is "what do you know..?" Imagine you're arguing with someone about how to make a lot of money? The other person thinks that the most money can be made working a typical nine-to-five wage shop and you think that the most money can be made with an internet business that involves not trading your time for money. You could say what do you know about nine-to-five jobs that makes them better than an internet business? Something that's so important to remember here is that the way that you say these words is just as important as the words themselves and you need to say them in an overconfident way. Even if you don't actually believe what you're saying. Imagine some guy is trying to fight you, you could say do you really think that you could beat me? In a very confident way and by doing so you will actually cause him to doubt himself and rethink whether he is actually capable of beating you or not. Keep in mind that the more confidently that you say the words the greater the amount of self-doubt that you will create within the other person. This is actually a major trick that boxers and MMA fighters have been using for years and if you've ever seen them talking to a reporter right before a major fight they'll arrogantly say that they are the best and that nobody will ever take away their title. Anytime that you want to win a verbal argument all that you have to do is call out the other person's knowledge base that they used to form their opinion and doing this confidently will cause them to doubt everything that they know about the topic. For example, do you really think that you have enough muscle to beat me up? So what do you know about the value of this car? or you could say something like how do you know how much it's worth when dealing with a car salesman. Before we continue let me ask you a question, how would you feel if by this time next year you were still stuck with almost no social skills and still having trouble interacting with girls? At the next key combination of words that you can use to get anyone to do anything is the phrase "how would you feel if" and I just used it to ask you how you would feel. Chances are the question that I just asked you about where you would be next year probably made you feel a sense of loss. Almost as if you're losing out on something. Something important to remember, every single decision made by every single person on the planet is either to move towards pleasure or away from pain. At its core, this is what every decision is based on and as it turns out all humans are more motivated to move away from pain than they are to move towards pleasure. This is one of the key points that you need to remember if you ever want to get into sales. When I first started working out it was the pain of being skinny and weak growing up that kept me going not the pleasure that I would gain from getting bigger muscles. Imagine you want to persuade someone to work out with you, say to them how would you feel if you're 40 years old and still overweight or how would you feel if you're 40 years old and still skinny and weak. Maybe you want to motivate someone to start a business or change their life for the better. Ask them how would you feel if all of your friends from school were super successful and you're 40 years old and still living at home with your parents? This combination of words works because it motivates the person to take an action that you want to either move away from the pain or towards pleasure. And it can be used either way, but the version that highlights the pain works the best. Now the final key phrase is something that I use in my articles all the time and it consists of two words, "Just Imagine"
Something that you need to understand is that every decision we make as humans is actually made twice first in our mind and second in the real world. If a person can't imagine themselves doing something then they won't do it it's really that simple. For example, before a girl decides that she's attracted to you she quite literally must first be able to see the two of you together in her head. When you walk into the dealership to buy Lamborghini you don't need to make up your mind because you've already imagined yourself buying and driving it a thousand times because it's an awesome car. Just imagine for a second that you have weeks and you're flying through the clouds over a tropical island. While I just said that your subconscious took over immediately and you probably just imagine exactly what I said. By saying to someone just imagine, you can plant a mental image into their head and once they've imagined themselves doing it they'll be more likely to actually do it in the real world. For example, just imagine how powerful and influential you'll be after you're finished reading this article and imagine how you'll be able to get anyone to do almost anything you want, just imagine how much you can improve your life and how much more successful you'll be after you read all of the articles on this blog? Tags : "buzzfeed" "control" "facts" "friends" "how to make people do anything" "manipulation" "people" "psychology" "success" "trick" "tricks"